It’s been little over a month since our amazing trip to New York and I’m already ready to go back. Who am I kidding?! I didn’t want to leave. New York is my happy place (besides Paris of course). It is full of delicious food, beautiful views, amazing Broadway shows, the most gorgeous parks, cute boutiques and always leaves me wanting more. Last time we went to New York we went during December and were in awe of the decorations and definite feeling of Christmas spirit. It was snowing and just magical. We decided to go back this time in December because we loved the season vibe so much. This trip is was not snowing, but actually around 65 degrees and sunny. We got a totally different New York vibe and loved every minute of it. Today I’m excited to share with you where we ate, drank, explored and stayed in New York City! We stayed at the Marriott Springfield Suites in downtown Manhattan on Fifth Avenue – about a 6 minute walk to Bryant Park and a 15 minute walk to Rockefeller Center. It was the perfect location. Definitely more of a touristy place to stay but easy to get to most of the main attractions. If you want to go to New York and not stay in a touristy location, Soho is a great choice and probably where we will be staying next time because we loved it so much! Top of the Rock: We debated back and forth about going to the Top of the Rock (the top of the Rockefeller building) or the Empire State Building. After some research, we heard that the Top of the Rock had the best view of Central Park and decided to go there. We bought tickets on site & only waited in line for about 10 minutes. Talk about a gorgeous view! The scenery and view got better and better the higher we climbed. Rockefeller Center: Rockefeller Center is known around Christmas time for their beautiful Rockefeller Christmas tree and ice skating rink. We grabbed a coffee and pastry from Bouchon Bakery (across the street from Rockefeller) and sat and watched the ice skaters. Talk about feeling all the Christmas feels! So magical. Rockefeller center is also full of tons of restaurants and shops and across the street is the beautiful St. Paul’s Cathedral. Times Square : Duh! Of course if you go to New York, you are going to go to Times Square. Talk about touristy and full of people but a must see and visit if you’ve never been. Central Park: If I lived in New York, I would be roaming around Central Park ALL THE TIME. It’s just gorgeous! It’s amazing to think that this huge beautiful park is in the middle of such a large busy city. Last year we walked through Central Park in the snow which took my breath away it was so pretty. This year it felt like fall and was just as pretty. I recommend grabbing a coffee and taking half of a morning or afternoon to just stroll the park. Bryant Park: Bryant Park was just a 6 minute walk to our hotel so we passed by it almost everyday of our trip. In the middle of the park was a Christmas Winter Village which was full of small shops and such good food. It reminded me of an outdoor market that you could spend hours exploring. They also had ice skating in the middle of the park which was fun to watch. New York Public Library: I talked a little bit about the New York Public Library in this post here, but I’m so sad to say we didn’t get to go inside. Next time I can’t wait to explore the inside as I heard it’s amazing! People were outside eating lunch on the beautiful marble steps and it reminding me so much of Gossip Girl. Such a gorgeous building! Statue of Liberty: Last time we came to New York we didn’t see the Statue of Liberty (because it was so so cold) but this time we were able to do a one hour cruise to the Statue because of the outrageously gorgeous weather. It is so crazy how big the Statue looks once you get up close to it. We used Circle Line River Cruises and loved it. Great price, fun guide and we loved that we could get up and walk around the boat. Broadway: I HIGHLY recommend seeing a Broadway show while you are in New York. It’s quite possibly one of my favorite things to do, ever. I’ve seen many many shows, some a couple of times, and it never gets old. During our trip, we saw Les Miserables & Elf. Obviously Elf was just during Christmas time but Les Miserables is there all the time and it’s such an amazing performance. Elf was also adorable and great for kids. (Last year during Christmas we also saw the Rockettes perform which is also an amazing performance and perfect to bring kids too.) Many people think that Broadway shows are too expensive, which agreed, some of them are outrageous. There is always the TKTS Discount Ticket Booth in the middle of Time Square, where you can get discounted tickets on day-of performances. Another thing that Bryan & I have learned to do is to go straight to the ticket office of the show we want to see. For example, we went to the Les Miserables theatre ticket office around noon on the night of the show and asked if they had anymore available tickets for that nights performance. We got box ticket seats for $37 a ticket! Such an amazing deal! So that is always an option if you want to save money. But definitely go, it’s SO worth it. Washington Square Park: This was my first time at this park and I absolutely loved it! Such a cute space which was great for people watching. The famous Arch is there and is such a pretty site. If you are in the Soho area next time, you have to grab a coffee and just sit down on the park bench for a while – it’s just so relaxing. Grand Central Station: Next time you are in New York, take an hour of your trip and make sure walk through Grand Central. It’s incredible. The hustle and bustle and the beautiful architecture is just amazing and a must see. Laduree SOHO : Hands down one of my favorite parts of the trip. I felt like I was in a dream land where everything around me was insanely beautiful – food, decor, pastries, people! We got to sit out on the veranda and have the most gorgeous brunch. And you better believe we didn’t leave without a box of macaroons! The Spotted Pig: Ok, now this place is just ridiculous. Everything we ate was SO delicious- including the burger which is probably the best burger I’ve ever had. (this is not a lie) They also have an awesome drink and beer selection. We will definitely be back here. (fyi – We waited about 45 minutes for a table, which is the average wait, but it was definitely worth it). Jack’s Wife Freda: Ok, now we didn’t get to eat here (even though everything on the menu looked delish!) but we did stop by the bar for about 20 minutes and enjoyed an espresso. What a cute spot with such a trendy vibe. We will eat here next time for sure! Serendipity 3: I’ve wanted to eat here for the longest time. You have to have some major patience to wait for this place. They are known for their frozen hot chocolate and for being in the movie Serendipity. We tried to go here twice on two different days and the wait was over 3 hours both times! Can you believe it?! Next time, I’m determined to actually sit at a table in this place and enjoy a frozen hot chocolate! The Ginger Man: Now this is a place that Bryan really wanted to go to and I was surprised at how much I like it. It has the feel of an Irish-like pub with a very amazing beer selection. We both did a beer tasting flight which was very fun and had hot panini sandwiches which didn’t taste pub-food-like at all. Very good! We also had soft pretzels with their homemade beer cheese! Yum! A definite fun spot to make your beer loving hubby happy! Bo’s Kitchen & Bar Room: We ate here for dinner one night and loved it! It has a very New Orleans feel to it and everything we ate was delicious! Their craft cocktail list was out of this world and we started with the seafood chowder which was perfect. They also have some fun things on their menu including alligator & fried chicken! Reichenbach Hall: This beer hall was right next to our hotel (literally a 30 second walk) so every time we passed it on the way back to the hotel it peeked our interest. On our last night in NYC we walked downstairs to enjoy this German-like bier hall and couldn’t feel more like we were back in Munich. Pretzels, sausages and a HUGE German style beer list – very fun atmosphere! Park Avenue Tavern: We happened to “fall upon” this spot on the way home from seeing Elf on Broadway. We didn’t really have dinner plans and thought this looked like our type of place. Good American style food, fun atmosphere and good wine! Il Forno: We ate here on our last trip and had such a good experience, we decided to go back. It’s a small little Italian restaurant with authentic food, fun servers and a good wine list. To be honest, we didn’t enjoy it as much as we did the first time. The pasta was good, the wine was just ok and there was a very loud dance club next door. So I would say it’s hit or miss. Houston Hall: If you asked my husband what was one of his favorite spots of the trip, he would probably tell you Houston Hall. 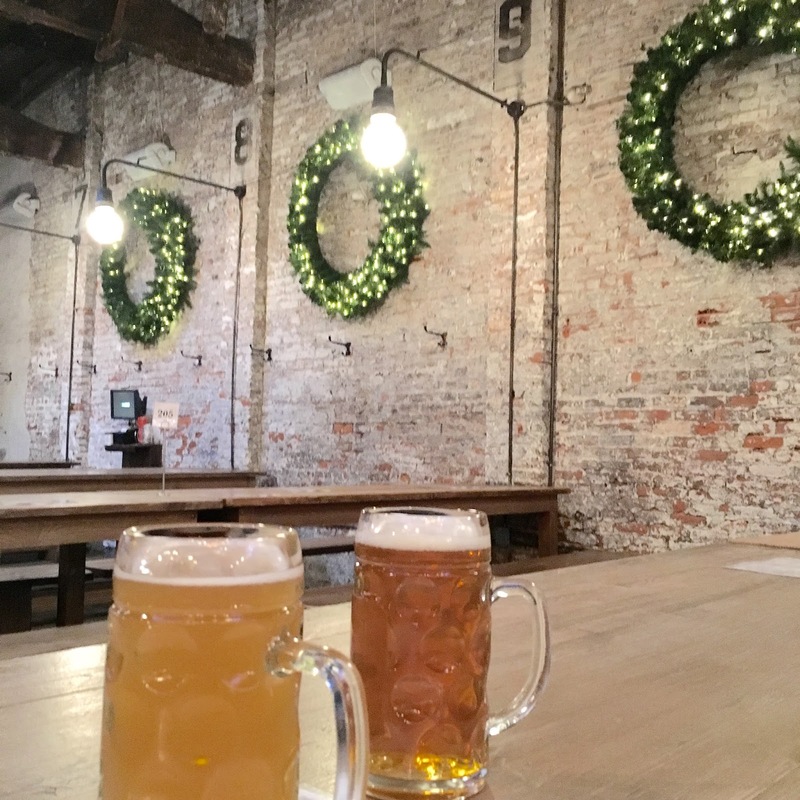 This HUGE beer hall & brewery is located in a warehouse type building that is so big you really can’t believe it’s in the middle of busy New York City. Long tables, huge beers and a really fun atmosphere! Juniors: Everything you research about spots to eat in NYC, Juniors pops up as a must stop for cheesecake. They actually have a location next to the restaurant that is just for to-go cheesecake orders! We stopped here, order a piece of plain cheesecake and a piece of marble swirl cheesecake and took them back to our room to enjoy! It was absolutely delicious and the some of the best cheesecake we’ve ever had! Grand Central Station Oyster Bar: We were so excited to try this spot and realized once we sat down that it totally wasn’t what we were expecting. We were expecting a pretty and fun champagne oyster bar but felt like we were sitting inside a touristy Bubba Gumps. We also got oysters (which we usually love!) but these oysters we weren’t big fans of. All in all, we probably won’t be back here but glad we tried it. Tavern on the Green: Besides Laduree this was the other highlight of our trip. We absolutely loved this place. Talk about feeling fancy and sophisticated! It’s located right in the middle of Central Park and we made reservations the night before to stop in for oysters and bubbles. They had a live jazz band playing in the middle of the restaurant and we were enjoying the atmosphere so much that we ended up staying & ordering lunch. We were dining in the crystal room for about 2 hours and loved every minute of it. We will definitely not be back to New York without stopping in here! Phew! That was a long one! Thanks for sticking with me. Overall, we had such an amazing trip! One thing we’ve learned while traveling is that there are always going to be restaurants that are just ok or places you only need to experience once but it makes up for when you find new places that you really love! Hopefully I’ve helped give you guys some ideas & inspiration for a future trip to New York. If you have any recommendations for our next trip to the city, I would love to know. Leave me a comment below with some of your New York favorites! Have a great weekend!